Planting flowers or an organic vegetable garden should be enjoyable. Spending time in the garden (call me crazy, but I even like weeding!) is a great way to relieve stress and connect with nature. However, spending time working in the yard or garden is not fun if you wake up sore the next day. 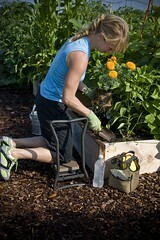 Stacy’s number one rule to avoid next-day soreness and even injury while gardening? AVOID BENDING OVER AT THE WAIST! Remember to keep your work close to you and tighten your abdominal muscles if you need to reach or move. Finally, if the terrain or your knees won’t allow you to sit or kneel, simply lunge forward and support yourself with one hand or forearm on your front bent leg.